The message of this lecture is that black holes ain’t as black as they are painted. 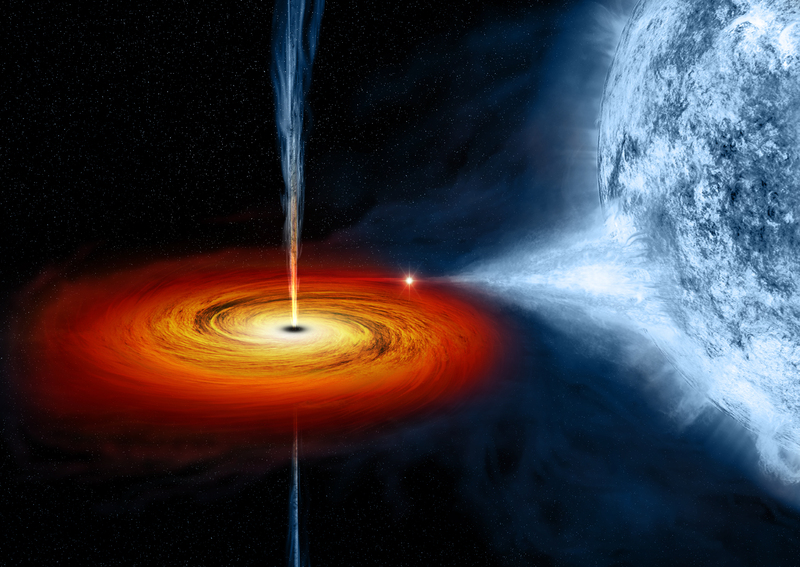 Hawking has put forward a new theory around information surviving in a black hole. The Information Paradox results from a conflict between quantum mechanics and general relativity. One posits permanent destruction of all matter while the other necessitates preservation even when faced with something so ultimately destructive as a singularity. Hawking has suggested it might be possible for information about an object to survive on the boundary – the event horizon – or pass through into an alternate universe. Which immediately got me thinking. See, Hawking suggests that if information about an object did survive on the event horizon, it would be as a chaotic mess. – have arrived at the station first and seek to identify whether the station has found any retrievable strings of information. Legend tells that a particularly powerful artefact was once ejected into the void by extremists of a previous World – and it might not have ended in the state of oblivion they had hoped. Call of Cthulhu – Less an adventure idea, more a consideration of concept. As I listened to the piece of news on the radio, I immediately had a vision of the event horizon. As bits of information accrete on the boundary, they appear like splashes of oil on a puddle. Flashes of Colour. With a capital C. The birth of a Colour resolves over immeasurable time, the product of chaos given form. Information from our universe and others steadily gathers, and probing tendrils of that newborn seek out nearby worlds for the energy needed to break free. Doctor Who – When The Doctors found a way to save Gallifrey, they did so by sealing a moment away in an image and then hiding that image away. Some suggest they cast the image away like a message in a bottle, certain that it would remain safe that way. They sealed the moment – the snapshot of Gallifrey’s existence – away with a lock and the key… well, that’s the single thing everyone seems so intent on finding – the Name of the Doctor. All would be well if not for the existence of at least one other version of The Doctor, seemingly trapped in a parallel universe beyond reach. Rose’s Doctor. However, The Doctor couldn’t account for the strange variables that allowed for the existence of this reality, nor the rapid entropy in that universe. See, in the parallel universe there is no Logopolis, no one to monitor, calculate and make adjustments to prevent the heat death of the universe. The singularity at the heart of the parallel Milky Way has already flared wide in the early death spasms of this universe – destroying everything, including Rose and her Doctor. But, it would appear that nothing can truly vanish. Something has detected the cough of information spilling through into our universe from the singularity at the heart of the Milky Way. As the parallel twin consumes everything, a chaotic spray of information emerges and gathers on the event horizon in our universe. A dark construct lingers on the edge of the singularity, an echo of a landscape peopled by shadows and looking like some fleeting memory of the Death Zone. A tower at the heart of the zone pokes out into the very limits of the horizon – and a corona of strange coloured fire flickers around it, seeking one string of information… While in the catacombs of the tower sits a painting. A canvas showing a single glimpse of a world thought lost. Previous: Previous post: Where’s the Sense8 in it?